Jules Verne may be best known for his works 20,000 Leagues Under the Sea, Around the World in Eighty Days, and Journey to the Center of the Earth, but he also drew heavily from Defoe’s model of shipwreck novels. 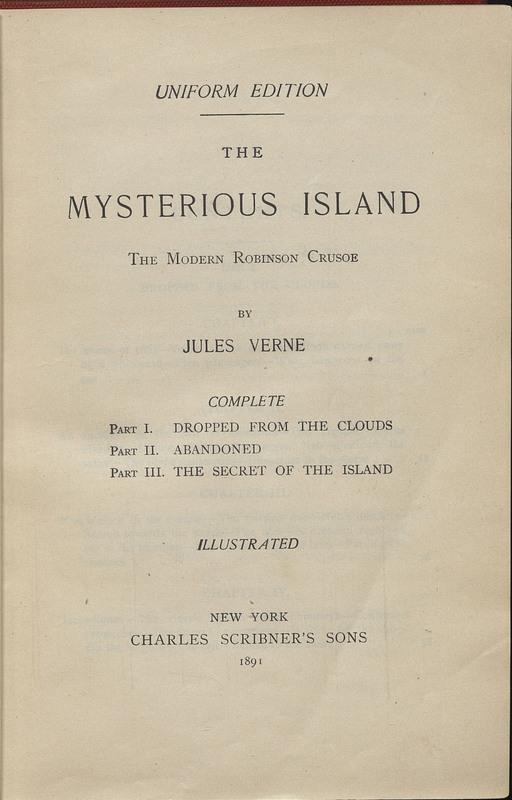 As the title of this work implies, Verne reimagined the Crusoe story in the same universe as 20,000 Leagues, exploring how Northern prisoners of war during the U.S. Civil War would fare in surviving on an unknown deserted island. Verne would later revisit this Robinsonian theme with his work Godfrey Morgan (French: L'École des Robinsons), this time featuring a young man and his teacher being stranded on an uninhabited island. Verne was also such a fan of Johann Wyss’ Swiss Family Robinson, also featured in this exhibit, that he wrote a sequel to the novel titled The Castaways of the Flag. The Mysterious Island. Baltimore: The Limited Editions Club at the Garamond Press, 1959.